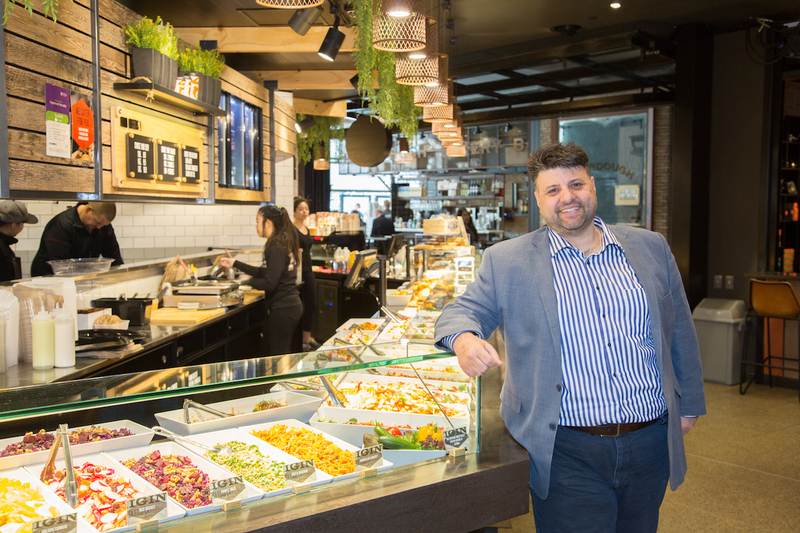 The fast food chain has an appetite for growth, a taste for franchising and a gut feeling that fresh is best. The idea for the rapidly expanding sandwich, salad and coffee company grew out of its founders' desire to help people “eat mindfully” every day. The franchise’s competitive edge comes from providing a plentiful variety of food that is fast but also healthy. CEO Chris Mavris says that in order to achieve its goals, the business went back to basic retail basics. “When I was growing up, there were the old delis with masses of food, and the mantra was always: Stack them high and watch them fly; keep it low and it won’t go. We have the same mantra. It’s about fresh food and lots of it,” Chris says. Fresh and healthy is the philosophy at Soul Origin. The food is prepared from scratch each morning at the company’s central kitchen, then distributed to the stores where qualified chefs create the array of fresh choices on display. It’s a recipe that ensures quality and speed of service. The first Soul Origin store opened in 2011. Five years down the track there are 52 outlets throughout New South Wales, the Australian Capital Territory, Queensland and Victoria, with plans for 200 across the country by 2019. To facilitate such rapid growth, the company invested from the outset in the infrastructure to support that many stores. In contrast, the team at Soul Origin knew that unless the support systems and equipment were in place ahead of time, they would not be able to realise their vision for the future. Soul Origin provides a lot of assistance and encouragement to its franchisees. Chris says the company has been built on a culture of family, respect and self-belief. Chris sits down regularly with his area managers, suppliers and franchisees to discuss the business and talk about growth, both personal and corporate. He says these meetings inevitably turn into an opportunity for a beer and a chat.